Thanks to all who came to the opening! Hopefully some of you can make it to our talk on Tuesday. We're speaking about the ride, the show, maps, infrastructure, limits, constraints, etc. tonight at 6:30. Great show and Great talk. Make sure you check it out before it closes. The Passage ride is a true treasure of Los Angeles and Midnight Ridazz - the vision of Huell Howser and the hill adventures of Lord Baden Powell. If you missed our talk about the show and the ride last week at the gallery, we'll be delivering a similar (but slightly different) talk at Betalevel, in Chinatown, on Friday. I notice that there are some questions on the Book of Faces about the donut rating of the closing ride. It looks like it will be about 1.5 donuts - easy by regular passage standards, totally doable for casual riders. It's around 22 miles and basically flat (or without anything we'd call a "hill," at any rate). If things are going especially swiftly, there may be a "bonus" section in the middle, which would add a few miles, but nothing strenuous. 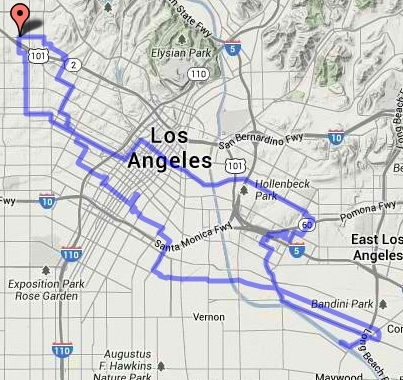 The bonus loop ended up being an extra 6 miles in all, but I trust that it was worth the effort. Also, now that you've enjoyed the show and the rides and the festivities, are you left wanting more? 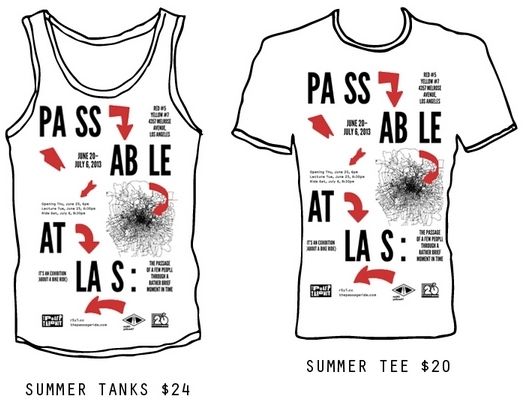 Do you want your very own Passable Atlas shirt to relive the joys of the past few weeks? Excellent! Nona, of Red#5 Yellow#7, is taking pre-orders here. All proceeds support Red#5 Yellow#7 and their future exhibitions!